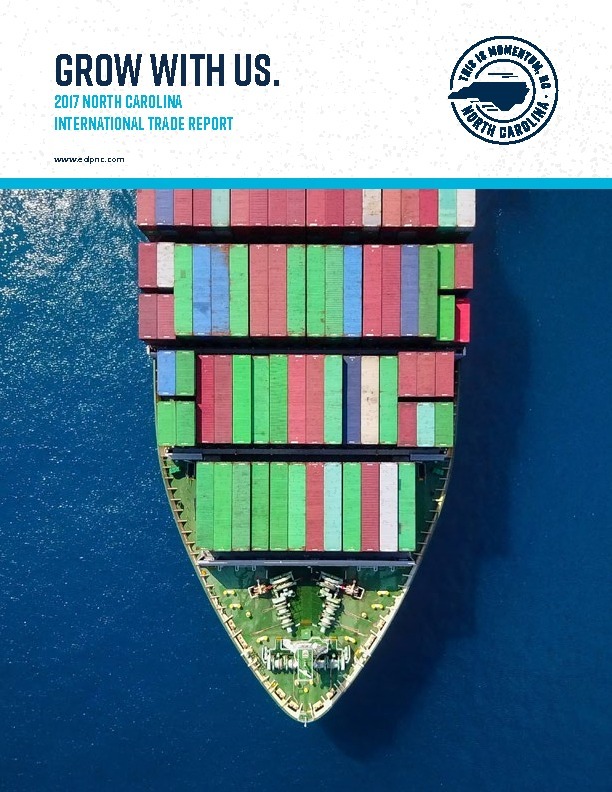 Read the latest North Carolina International Trade Report, get information on the North Carolina Passport to Export STEP Program and find additional international trade resources. With the help of steady global economic growth and a depreciating dollar, 2017 was a banner year for North Carolina exporters. In 2017, the value of exports from the state increased to $32.6 billion on a nominal basis, an 8 percent increase over the previous year. Growing exports is critical to North Carolina’s economy. More than 370,000 North Carolina jobs are supported by the state’s export activities, according to the Brookings Export Monitor. The 2017 North Carolina International Trade Report analyzes export data across multiple commodity sectors. The report summarizes trade and relevant economic information for each of the state’s top export markets: Canada, Mexico, China, Saudi Arabia, Japan, and the European Union. It also provides examples of how the Economic Development Partnership has helped companies increase their export activity. Designed to be accessible to a wide audience, the report serves as a high-level overview of North Carolina’s export activity for both business owners and local economic developers. The Economic Development Partnership of North Carolina (EDPNC), in conjunction with the U.S. Small Business Administration, provides funding to qualifying small businesses to offset costs associated with exporting. STEP funds assist companies with participating in foreign trade shows and trade missions; developing websites to attract foreign buyers; designing international marketing materials to reach a broader audience; obtaining services to support foreign market entry; and attending select export education courses throughout the program year. Click here to learn more about the STEP program in North Carolina. Find resources from across the U.S. Government that help American businesses plan their international sales strategies. Learn how the Department of Commerce operates, get information on grant opportunities, find local contacts for services and offices in your city, and more. The North Carolina Department of Agriculture provides essential resources needed to bridge the gap between international buyers and North Carolina agribusiness. With offices on university campuses, the North Carolina SBTDC provides management counseling and educational services free of charge to small and mid-sized businesses. EXIM provides trade financing solutions including export credit insurance, working capital guarantees and guarantees of commercial loans to foreign buyers. Find information on North Carolina’s ports, including customer service for your business, maps and directions, business directories and more. NCDEC provides expertise, mentoring programs and tools to small and medium-sized businesses interested in exporting. OPIC provides financial loans and guaranties, political risk insurance, and support for investment funds, all of which help American businesses expand into emerging markets. The U.S. Trade and Development Agency (USTDA) links U.S. businesses to export opportunities by funding project planning activities, pilot projects and reverse trade missions while creating sustainable infrastructure and economic growth in partner countries. Learn how the State Department works, find links to its bureaus and offices, and see examples of diplomacy in action. The IMF monitors global economic trends that affect the health of the international financial system, and provides technical assistance and resources to members in the event of a crisis. Learn about SBA assistance including access to capital (business financing), entrepreneurial development (education, information, technical assistance and training), government contracting (federal procurement) and advocacy (voice for small business). Each year, ARC provides funding for several hundred investments in the Appalachian region in areas such as international business development, education and job training, telecommunications, infrastructure, community development, housing and transportation.